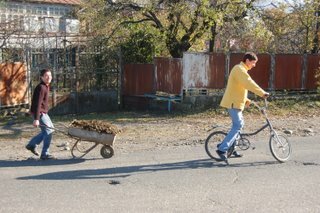 But here in the Republic of Georgia youngsters of all ages are faced with challenges Americans can’t begin to fathom. For instance, imagine spending your formative years in a small aluminum bucket. 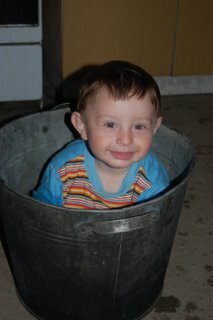 This poor child spends 20 minutes every three days stuck in this pail. It is an injustice. I’ve seen kids playing soccer with a deflated soccer ball or throwing rocks at turkeys simply because they have no other means of entertainment. But seeing this broke my heart. 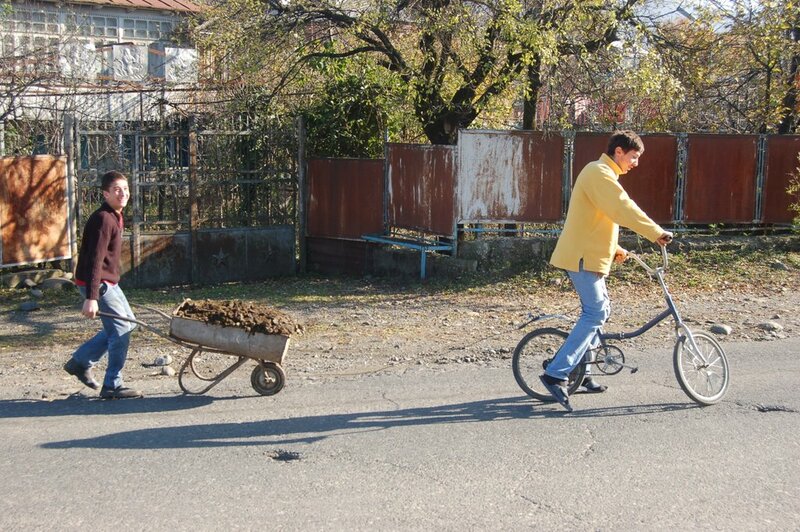 What kind of world do we live in where a child spends his weekend transporting manure by wheelbarrow up a gradual hill with only his brute force and the partial aid of a friendly cyclist? How do you think he sleeps at night? With terrible nightmares, I suppose. 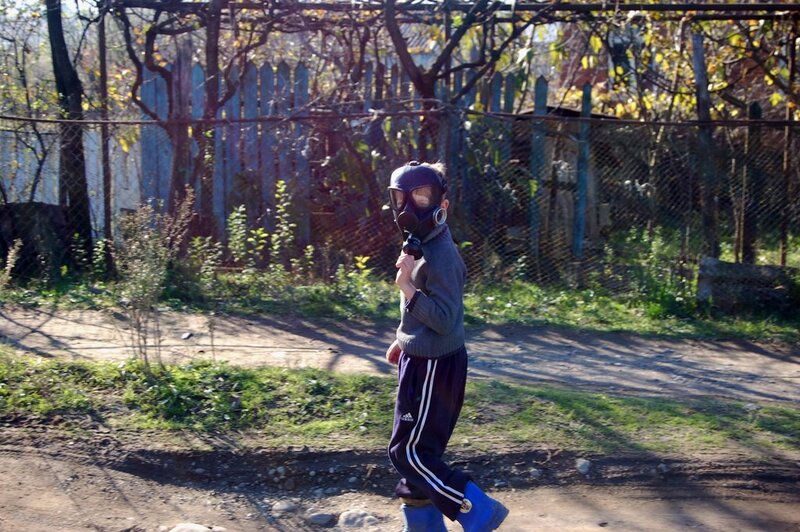 One can only imagine what horrible pollutants this boy was trying to avoid as I passed him the other day. Low grad plutonium or simply everyone in town burning their garbage on the same day? Still, he remains optimistic, unlike his friend who shrieked and ran for the woods when I went to take this picture. Dreadful. One of the greatest resources Georgia lacks is celebrities. 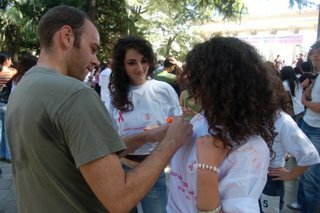 Without a Tom Cruise or a Brad Pitt in attendance participants at this year’s Breast Health Awareness Walk in Kutaisi had to turn to Peace Corps volunteers for autographs. Seriously. This is really sad. I’ve signed dozens of autographs since arriving here and for little more than possessing an American passport. But Georgians aren’t the only ones who are forced to suffer. Just imagine my own sacrifices. While some Peace Corps volunteers are banished to the ends of the earth, forced to live in huts made of elephant dung amidst malaria-infested swamps, I must endure something far worse—opulence. 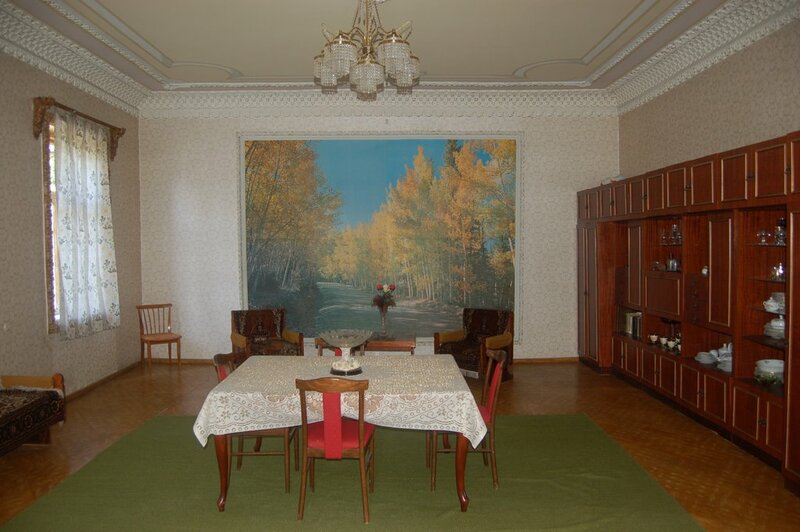 This is my banquet room. And tell me this, who is going to admire me and my dedication towards serving my fellow man upon learning I’ve been reading back issues of the New Yorker while drinking homemade wine in beneath a chandelier (please see picture below for bearskin rug). Please believe me when I say I have no heat and wash my clothes by hand. I take ice cold showers and suffer the degrading effects of intestinal parasites in a squat toilet. It’s not a total vacation. Sacrifices abound... the champagne is far too sweet for my liking and there is no sushi. Recently I ate “guacamole” made from ground peas and a seasoning packet and thought it was delicious. You people should send me some care packages.